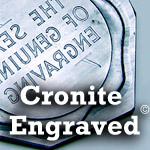 Since 1950, The Cronite Company has been supplying the industry with the finest in automatic sheet feeding equipment. The average press unit will show a daily productivity increase of 200-300% with an Autofeed sheet feeder installation. These are designed to improve performance of our intaglio presses. Advance a certain amount after sensing the pre-printed mark and then print. The flexibility of the set up is controlled by the easy to use programmable logic controller and control panel mounted on the feeder frame. The built in drying loop on the feeder frame allows for ambient air drying of stock printed with water based acrylic inks in a very compact space. An infrared heater can be mounted to the frame for drying varnish based inks. In addition, sensors throughout the drying loop monitor that there is no break in the web and will stop the impression and web if necessary. In order to maximize the potential uses for the 5 x 9 presses, the press can be set up with a quick change option. The quick change option allows for the continuous feeder to be moved away on its easy glide castors and the sheet feeder be quickly moved into place for other jobs. 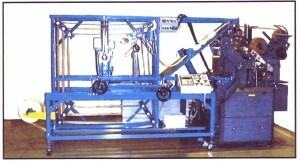 Therefore, one press can be fed by both the sheet and web method. In an industry where time and production costs are so closely related, the use of an Autofeed becomes an investment in profits, as well as quality. We designed the Autofeeds to be quick and easy to set up minimizing down time between jobs. On the High Speed 8000 Feeder, search suckers lift the stock up onto the main section of the feeder and allow for a wide tolerance in pile height. This allows the operator to change jobs without having to make pile height control adjustments. Only simple gauge changes are required on the transporter section when changing jobs. Since paper is always pushed into the same position with the same amount of force as the sheet before it, consistent registration is easy to obtain. 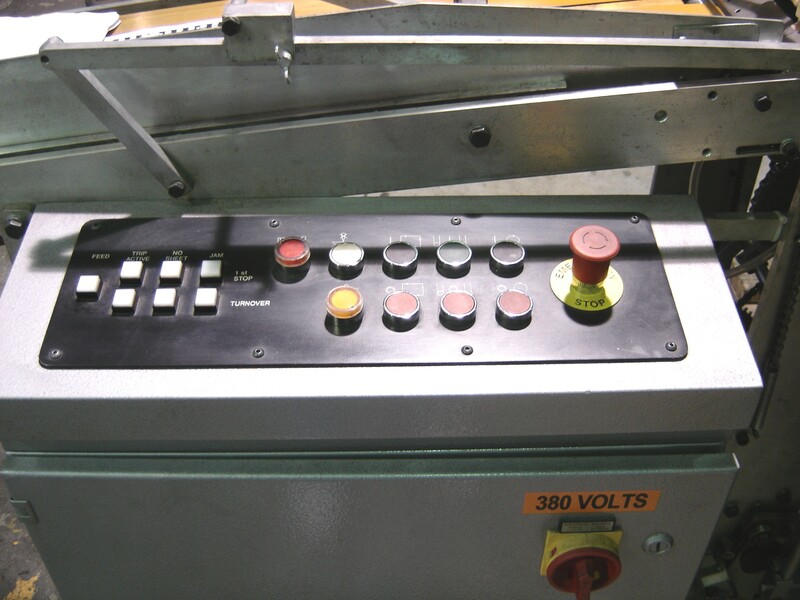 On the High Speed 8000, photocell sensors are installed before the sheet enters the press and at the turnover section after the sheet has left the press. These sensors detect both the absence of a sheet when one should be there as well as the presence of a sheet when one should not be there. When needed, they take the impression off the press to avoid damage and when necessary they will stop the press completely. The electronics used is state-of-the-art integrated circuitry with memory capabilities from the control panel. The continuous feeder is our most recent innovation. 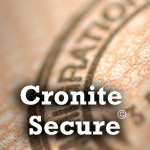 It is used around the world to produce labels, product authenticity stickers, secure business checks, tax stamps and many other items. Advance a certain amount after sensing the pre printed mark and then print. The flexibility of the set-up is controlled by the easy to use programmable logic controller and control panel mounted on the feeder frame. The built-in drying loop on the feeder frame allows for ambient air drying of stock printed with water based acrylic inks in a very compact space. 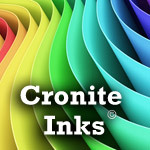 An infrared heater can be mounted to the frame for drying varnish based inks. In addition, sensors through out the drying loop monitor that there is no break in the web and will stop the impression and web if necessary. The Cascade Pneumatic Feeder is designed to automatically feed card stock or envelopes from 3½” x 4¼” up to 8″ x 10″ into a 2½ x 4 Carver, 2½ x 4 Modern, 3 x 8 Carver, 3 x 8 Modern, or 4½ x 9 Carver Press. This easy to install and operate unit increases productivity and profitability. Set up time for the Cascade Feeder is quick, making it practical for both long and short press runs. Three simple mechanical adjustments on the feeder are used to position the impression on the stock. On short runs, the operator can prepare the materials for the next run. On longer runs the operator is free to inspect and package the work in process. 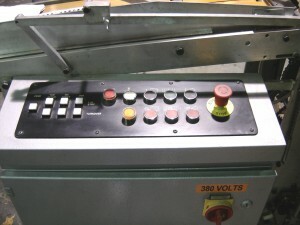 The card or envelope leaves the magazine stack and is guided by belts against a backrail to the stamping position. When the stock stops at the side guide, it is pushed into register position, then the gripper assembly holds it in place during stamping, ensuring perfect, repeatable registration every time.